Ten tracks for listening and dancing. A new electro sound like Justice, Mr. Oizo and Daft Punk. List Price: $17.99 New Price! 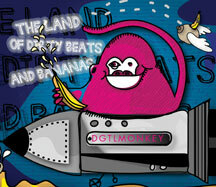 "The land of dirty beats and bananas" Dgtlmonkey first album, is a much various album where you can find all shades of electro house scene with an innovative approach. Are ten tracks to listen as well as for dancing, ranging from a new electro sound like Justice, Mr. Oizo, Daft Punk, up to get to touch the dark sonority style of Trentemoller, through the influences of French Touch and 80's music. In "The land of dirty beats and bananas" Rock, funk and classics arrangements mix with distorted synths and melodic pad, creating a warm and emotional electronic crossover. The awesome album title gives a pretty good indication of where this Italian digital maestro's head is at. Sometimes it's dreamily robotic -- kind of like Kraftwerk remixing Bat for Lashes and AutoKratz. But mostly it bangs like a fresh-from-rehab Mary Carey on a coke binge at a Boyz Noise after-hours. The best part, though, is that unlike most ravetronica heroes, the music here doesn't careen into complete teeth-clenching chaos.